I did this one a while ago. I just finished this and wanted to post the pictures for you. I figured out the weird "blue" problem with my camera so all is well, LOL!! (Images are clickable for enlargement). 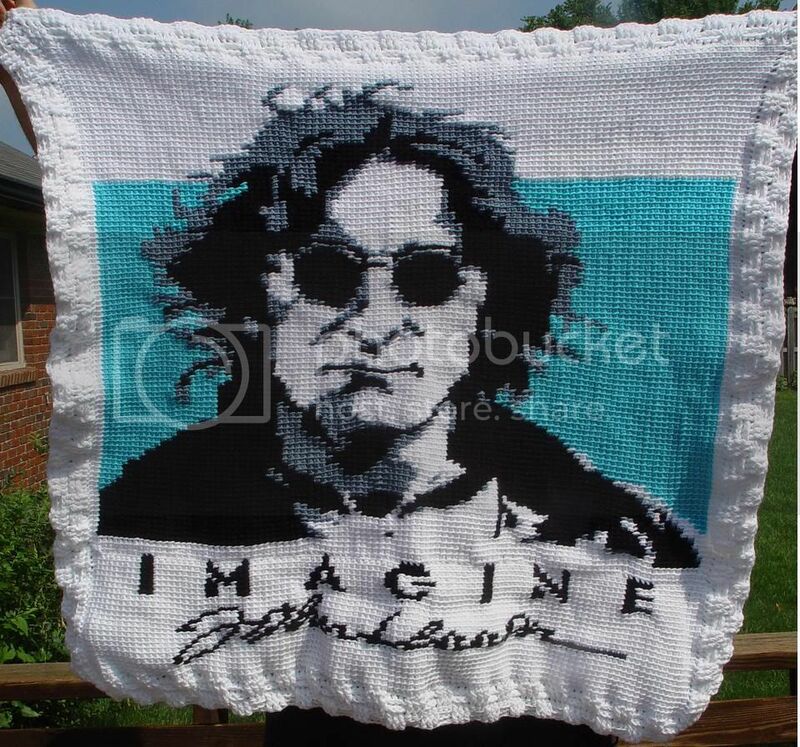 This is also crocheted tunisian style using a graphed photo of John. I took the "Imagine" words and autograph from another picture, graphed them as well, and added them to the bottom of the blanket. Visit 1 Cool Chick's homepage! Challenge 1 Cool Chick in the Arcade! Thats an great Afghan. You did an great job. Wow, that's amazing, 1CC! Well done! If Linus had had a blanket this wonderful, he'd have been a font of security! Thanks guys! Your comments really made my day! And thanks to Asha, I have a fabulous new nickname in "1CC" I love it! Anyway, I'm working on an Elvis one now. (My hubby is a big Elvis fan). LL9 and 1CC, those are really great! 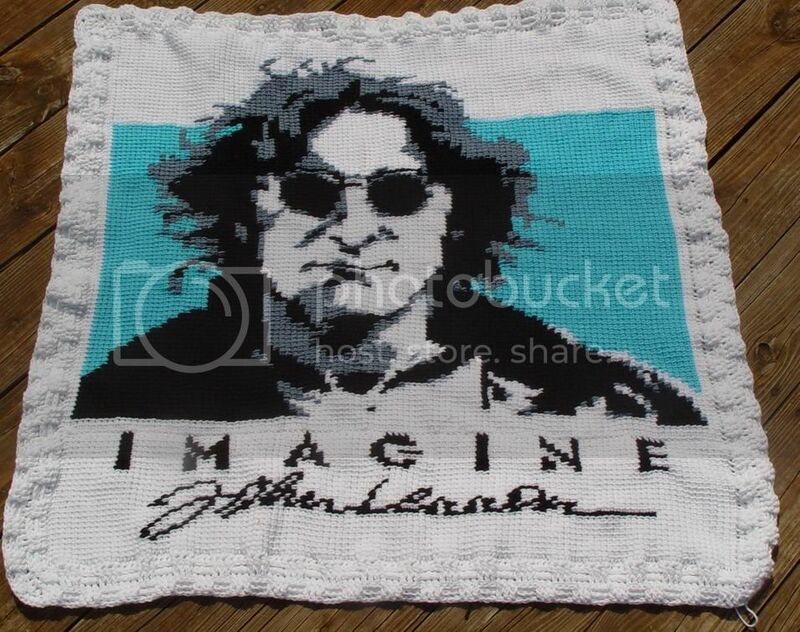 I love the Imagine afghan. 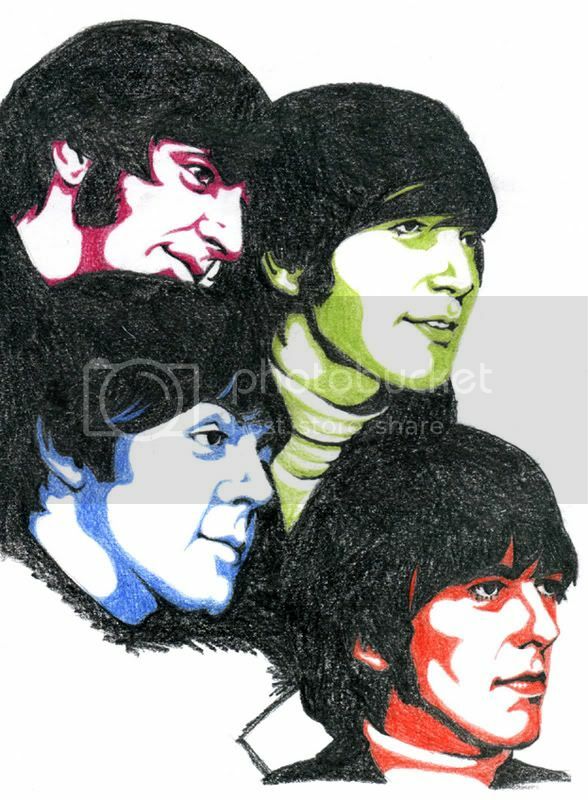 LL9, the picture of Paul 1967 and the last one of John were both really great! Makes me wish I could draw/paint/do anything. It's the land that is our wisdom; it's the land that shines us through; it's the land that feeds our children. It's the land- you cannot own the land; the land owns you. Challenge cokate in the Arcade! 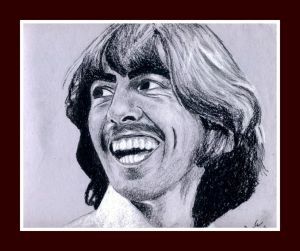 This picture was done by Pattie Eyes of george Harrison! That's cool! I like the composition! Here's a pic I am nearly finished on - a gift for a friend's birthday. It's coloured pencil, a little smaller than A4, referenced from a photo I found here on the picture forum! Challenge LateForTea in the Arcade! I'm always amazed at peoples' talent when it comes to art. That's a beautiful picture - your friend is going to love it!